There was a steady flow of people around the U-shaped Zeiss display at PhotoPlus Expo at the Javits Center in New York. On the left side were the M-mount rangefinder lenses. In front were the lenses for mirrorless cameras – Fuji X-series and Sony Alpha. On the right was the Canon EOS and Nikon F mount offerings. a model using their gear. Let’s get one thing out of the way quickly. All of the Zeiss lenses are premium optics. They are higher-priced third-party lenses for those who want or need more from their film and digital cameras and can afford to satisfy that desire. The rangefinder lenses have built a reputation for providing a high-quality alternative to Leica optics, and Zeiss followed that by introducing lenses for other cameras and camera systems. 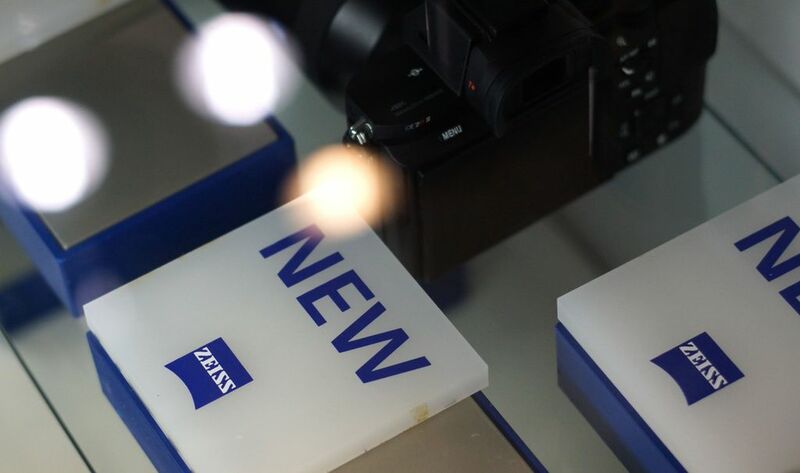 A couple of years ago, Zeiss created the Otus lins. Currently, there are three Otus lenses – 28mm, 55mm and 85mm. All are f/1.4, and all are physically large lenses, and they are tall and heavy and filled with metal and glass. These are not budget offerings, and they are the costliest of the Zeiss lenses. In my half an hour at the counter, the Nikon and Canon counter remained busy. The rangefinder side was moderately busy, and the mirrorless counter saw nearly all Sony A7 owners. There probably were some Fuji owners, but I was busy asking questions and didn’t keep track of everyone looking at lenses. That was just an informal observation. I had questions about the Zeiss lenses. The Zeiss rep had answers. Why do the new lenses look so different? Zeiss decided to create a unique barrel design in part to separate themselves visually from the rest of the pack. The straight cylindrical design has been with us for a couple of centuries, and Zeiss decided it wanted to create a unique identity. While the the Loxia line has a traditional look, the Otus, Milvus, Touit and Batis lenses have smooth barrels that gently flare outward. The design follows through to the matched lens hood. What have photographers said about the new lens designs? With one exception, Zeiss says that photographers have accepted the new design. The one exception is in Japan, where the photographic press has been critical. 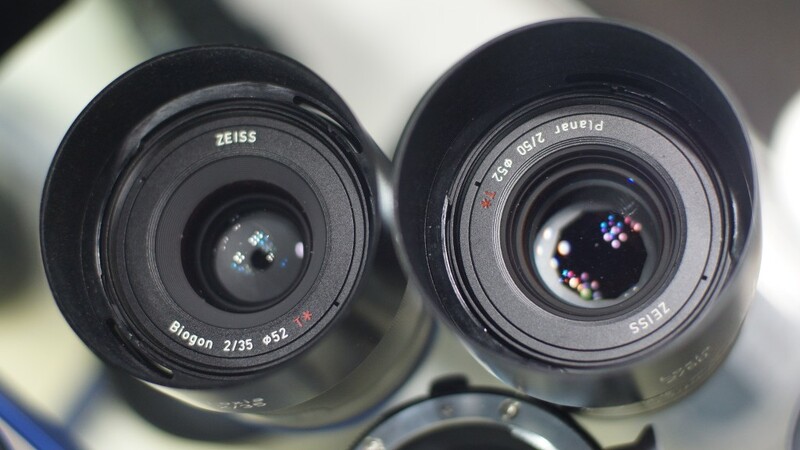 The lukewarm reception has carried over into China to a degree, Zeiss says. The rubber focusing ring is unlike anything that Zeiss - or anyone - has used on a camera lens What is it? The focusing ring is made of the same material that has been used for years on Zeiss binoculars. It is soft to the touch but your fingers easily grip the surface. Zeiss says that its binoculars are used in many different environmental conditions. That is, the ring should be very durable for long-time use in all types of weather. Zeiss says the focusing ring can be quickly replaced should it suffer some type of damage. Why are there are no autofocus lenses for Canon and Nikon DSLRs? The simple reason, Zeiss says, is that neither camera maker will allow that under its licensing agreement. Zeiss is permitted to produce EOS- and Nikon-mount compatible lenses, but those lenses can be manual focus only. To me, the reason is that both camera makers feel that Zeiss autofocus lenses might impinge on the sales of their lenses to pros and amateurs. Or perhaps Zeiss might outperform each makers’ lenses. In any case, if you are hoping for a Zeiss autofocus lens for your Canon or Nikon SLR, it’s not going to happen anytime soon. Where is Zeiss seeing the most interest in its lenses? While there is demand remains steady among Canon and Nikon DSLRs, Zeiss says there is growing interest in the mirrorless market for its products, particularly with the release of the Sony A7 full-frame cameras. Sony already has an ongoing partnership with Zeiss, so they have more flexibility in the development of products. Does Zeiss listen to its customers? I mentioned that one thing I would like to see is a Zeiss telephoto lens for Sony’s Alpha mount. He said that he would mention it to the team. I don’t know that Zeiss will be producing a telephoto lens just for me, but I was left with the impression that customer feedback about their products is important. Two of Zeiss' Loxia lenses for mirrorless cameras. Last edited by melek on Tue Dec 01, 2015 8:40 pm, edited 1 time in total.